There are two reports on the U.S. economy worth mentioning this morning. 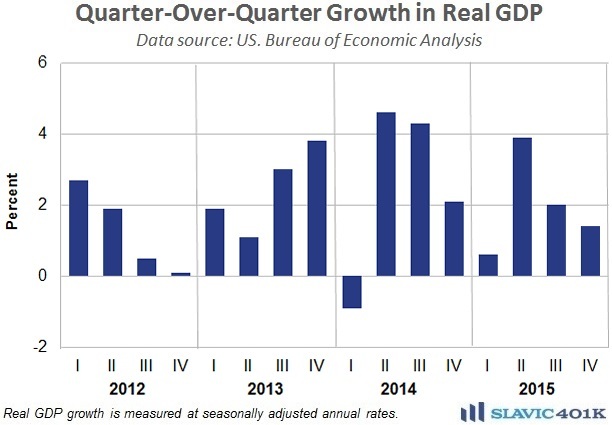 First, data from the Bureau of Economic Analysis (BEA) showed that gross domestic product (GDP) grew at a faster pace in the fourth quarter of 2015 than previously estimated. Specifically, real GDP, which measures the value of the production of goods and services in America adjusted for price changes (inflation), increased at an annual rate of 1.4 percent in Q4, up from the 1.0 percent preliminary estimate but still below the pace of growth seen in Q2 and Q3 of last year. Adjustments to private inventory investment drove the prior month’s upward revisions but this time it was stronger data on the services component of personal consumption and a smaller drag from trade that were largely responsible for the improvement to headline GDP growth. Looking ahead, the U.S. consumer continues to be one of the main drivers of economic growth but many analysts anticipate only a modest GDP print for the first quarter of 2016 due to last week’s disappointing durable goods report. In fact, the Federal Reserve Bank of Atlanta now expects GDP to grow by just 0.6 percent in Q1, down sharply from the 1.9 percent growth forecast made less than two weeks ago.